In times when the state budget and correspondingly every citizen have to face increase in healthcare costs globally the demand for generally available economic, qualitative, safe and effective medicinal products is increasing. The use of generic medicinal products in the course of treatment is an economic and socially reasoned solution aimed at financially sustainable healthcare, and it allows everyone start saving today. 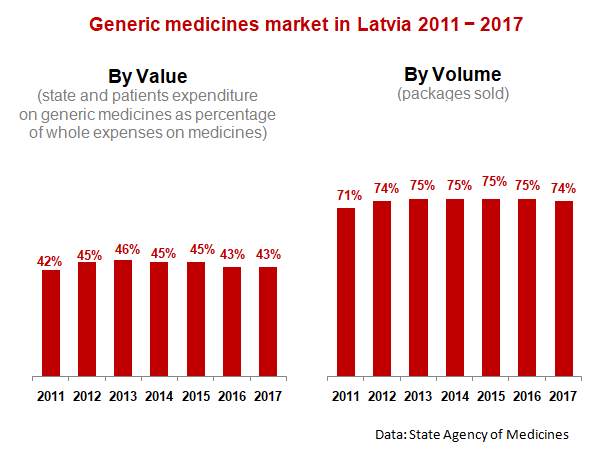 The Latvian Generic Medicines Association (LGMA) is a public organisation founded in 2003 and it associates the leading manufacturers of generic medicinal products operating in Latvia. Currently the association has 14 members - Latvian pharmaceutical manufacturers and dealers of foreign pharmaceutical companies with the total turnover of 24% of the overall turnover of the Latvian pharmaceutical market. Members of the LGMA represent approximately 50% of sales of generic medicinal products in Latvia.